Be the first to share your favorite memory, photo or story of Denzil. This memorial page is dedicated for family, friends and future generations to celebrate the life of their loved one. 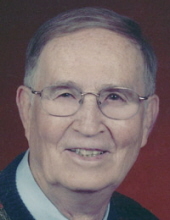 SUMMITVILLE- Denzil H. Elsworth, 92, Summitville passed away on Sunday, August 5, 2018 at Edgewater Woods in Anderson following a brief illness. He was born on May 15, 1926 in Summitville to Ferrell and Opal (Eaton) Elsworth and has lived in Summitville all of his lifetime. Denzil was graduate of Summitville High School-Class of 1945. He retired from Delco Remy in 1984 after 36 years of employment and was a member of UAW Local 662. Denzil supported his community by serving on the Summitville Town Council and was a Past President of the Council. He supported his family in many ways, including coaching Little League baseball for more than 15 years. He enjoyed bowling, camping, fishing, golfing and travel. Spending time with his family was most important to him. He was preceded in death by his parents, 3 Brothers-Norman “Nub” Elsworth, Virgil Elsworth and Jay Elsworth. Services honoring Denzil’s life and legacy will take place at 3 pm on Friday, August 10, 2018 in the Owens-Noffze Funeral Home, 1009 west Walnut Street, Summitville with Pastor Julia Bratton officiating. Interment will follow in Vinson Memorial Cemetery in Summitville. Friends are invited to call at the funeral home after1 pm on Friday prior to the services. Memorial contributions are suggested to the American Heart Association through the funeral home. Owens-Noffze Funeral Home is honored to care for Denzil and the Elsworth family. To send flowers or a remembrance gift to the family of Denzil H. Elsworth, please visit our Tribute Store. "Email Address" would like to share the life celebration of Denzil H. Elsworth. Click on the "link" to go to share a favorite memory or leave a condolence message for the family.